The “Tales of the Ketty Jay” series has been one of the most enjoyable series I’ve read in the last few years. It’s an unpretentious series more focused on entertaining adventures than literary depth but it has featured some compelling characterisation and some fascinating pieces of world-building (particularly the Manes and the long-lost Azryx civilisation seen in the last book). I’m a bit sad that the fourth book is also the last one, but at least the series has gone out on a high. Being the last book in the series it does sometimes feel a bit like a ‘Greatest Hits’ compilation as just about every significant character and plotline from previous books are all thrown together as Vardia plunges into civil war, culminating in an aerial battle over the capital with the crew of the Ketty Jay right at the centre of events. As if that wasn’t enough for a single book, each of the members of the crew (including, of course, the ship’s cat) all have their own plotline and get their own major pieces of character development. There’s so much being included in a book which isn’t particularly long that it is quite an achievement by Wooding to have it avoid feeling too rushed and for it not to feel like any of the characters or plotlines have been short-changed (although arguably I think Jez’s plotline could have done with a little bit more time spent on it). It also makes for a compelling and page-turning read, particularly as the story approaches its climax. Although I think it’s a bit of a pity that there aren’t going to be many more books, it is perhaps better to end this way than for the story to risk getting repetitive as it went on. 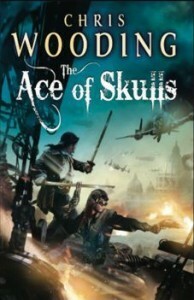 Particular highlights of the book include Crake’s experiments with daemonism as he tries to counteract the Awakener’s Imperators, I think the daemonists have been one of the most interesting elements of the world-building, reminiscent of Victorian scientists attempt to use reason and technology to harness mystical forces. The final battle is also very good, although for a series so focused on aerial combat it is probably events on the ground as Silo and Malvery try to lead an attack on an Awakener stronghold that is the most compelling part of the battle. Unlike some of the previous plotline the crew are being forced into an unaccustomed role where they are the heroes of the story, I think Wooding manages to make this work without losing the moral ambiguity that made them interesting characters in the first place. Overall, I think this might be the most entertaining book I’ve read all year and it’s a worthy conclusion to what has been a very good series.